In her talk Emotional Intelligence and Self- Awareness Surviving and Thriving in The Industry with Caryn Franklin, she discusses the reasoning behind the wall, and gives the audience an insight into conquering stress in the creative field. It can’t be stressed enough the importance of what really matters, your confidence and self-esteem and having a diverse perspective. One tip she gives “when working in a collaborative team is to recognise what you bring to the team and be clear with what you can and can’t contribute as that is vital. You bring to the group your emotional assets as well as emotional flaws- and you need to be honest before group work, so people can understand and help you”. 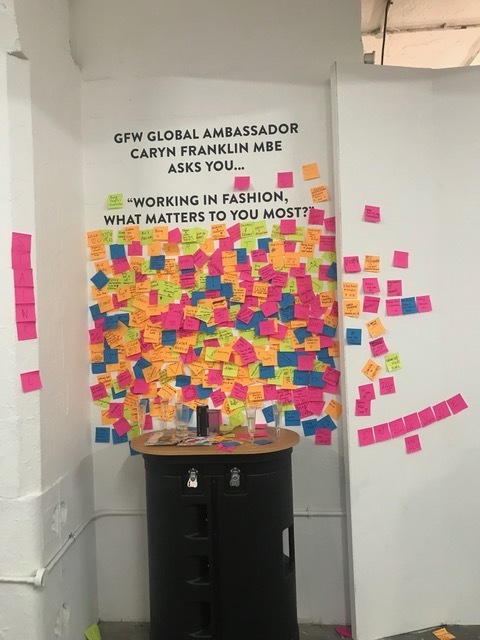 It was great to hear the perspective of many of the guests at GFW18, who pledged for many different things, such as sustainability, diversity and representation and being part of a team!